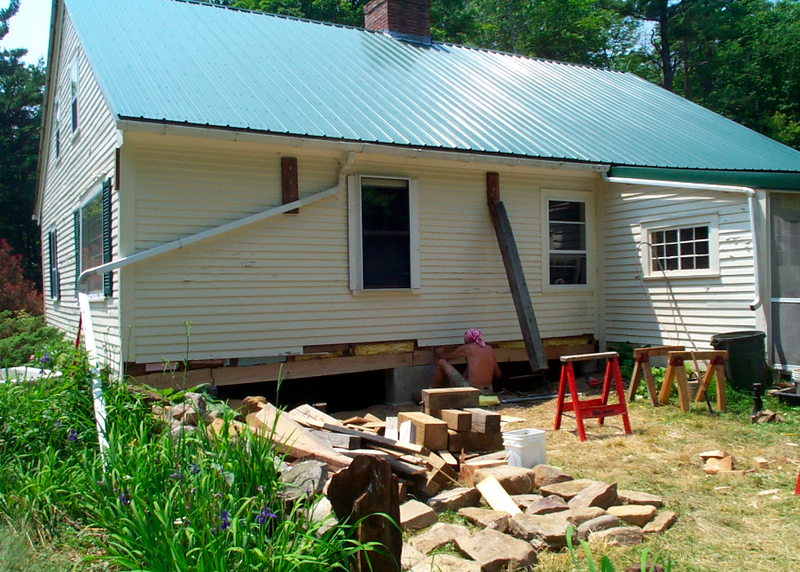 Last week I made the claim that eco-thrifty renovation is pragmatic rather than dogmatic. The mandate of ETR is low cost and high performance, but how to achieve that mandate is not predetermined. Some times it means reusing materials. For example, last week I wrote about reusing windows during our renovation, and the week before I described turning an old deck into a fence. But sometimes it means buying the highest quality, longest lasting products. For example, because we are in the sea spray zone, we replaced out leaky roof with the highest quality roofing iron. Although the initial price was higher than lower quality roofing iron, over the long run this decision will best meet the low cost / high performance mandate. The same can be said for compact fluorescent light bulbs: they cost more at the shop, but save money over the long term. One of the most sustainable buildings is the one that lasts a very long time. Still, even the best old homes need TLC now and again. That was the case for Trollbacken in 2007, when a seven-metre section of sill finally gave in to ‘powderpost beetle’ (borer). By sill, I mean a 300 mm by 200 mm timber beam upon which the entire post and beam structure rests. But to remove and replace it I would have to take the weight of the entire farmhouse off the sill. 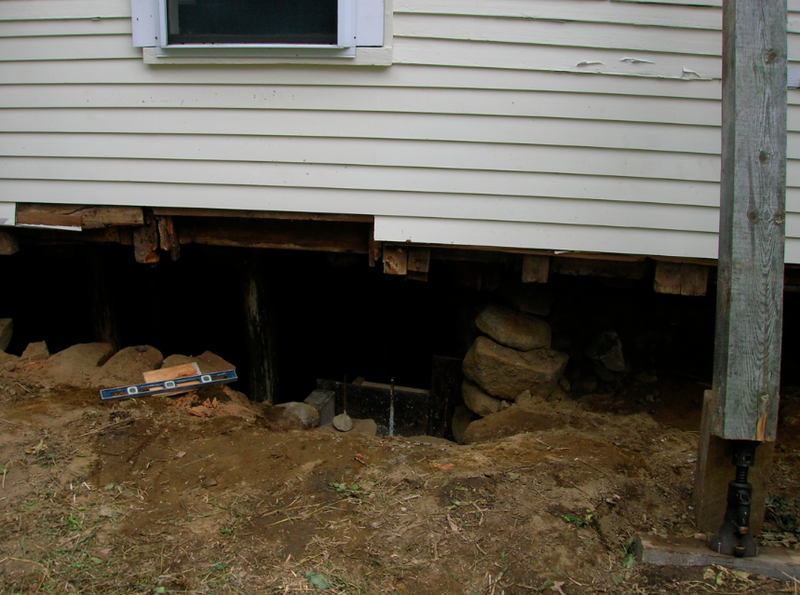 How do you jack up a 225 year-old home? Very carefully. I hired my neighbor and ZZ Top impersonator, Rick, to help me. He had never done anything like this before, but he was willing to give it a go. We fixed heavy blocks with carriage bolts into the top of each post, and then carefully wedged 100 mm by 100mm poles underneath the blocks at an acute angle to allow enough space to work. Then we used ancient screw jacks that I bought at an auction to un-weight the sill by the slightest amount. 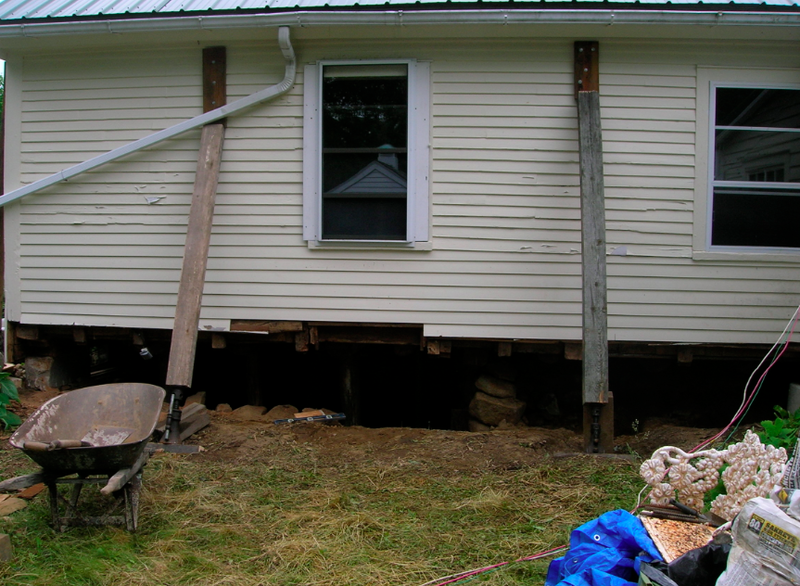 With one quarter of my home hanging by its shoulders I took a chainsaw to its ankles, cutting the sill out in sections. Once this was done, we made forms and poured footers. While Rick and I mixed 38 bags of concrete, we sent Dani into the cellar to ‘tamp’ the wet mix to remove air pockets as we shoveled it into the forms. Although she emerged from the chore hours later speckled, at least she was in the cool shade all day. I remember it was 38 degrees with bright sunshine, and it was difficult to determine who had the worse of the jobs. Although Dani did take a ‘wicked cool’ photo from her subterranean perspective. Once the footers were poured, Rick and I went to a local mill to pick up a replacement sill we had ordered. Back at Trollbacken, we cut mortises into the sill to match the tenons at the end of each ‘half-round’ floor joist. It was close to 40 degrees the day we installed the new sills and unscrewed the jacks. But it was worth it knowing the Trollbacken might last for another 200 years.